We have reached the last week of the regular season and the playoff picture is beginning to be clarified as several teams secure their spot in the brackets. We also have a new No.1 in Class 5A for the first time this season. Let’s check out the Kpreps Rankings to see how things developed after Week 7. Derby stays on top of Class 6A after beating rival Haysville Campus, 48-13. Quarterback Hunter Igo threw touchdown passes to four different receivers in building a 27-7 halftime lead. The Panthers have a huge showdown with Class 5A No. 3 Maize this week to decide the Ark Valley Chisholm Trail League – Division I championship. It its first real test of the season, second-ranked Lawrence Free State fell behind by as many as 13 points in the first half before rallying to beat No. 5 Shawnee Mission East, 36-30. Keenan Garber caught four touchdown passes from Malik Berry – including a 32-yard leaping catch at the end of the first half. The game was tied at 27 late in the third quarter when a Jax Dineen touchdown run gave Free State the lead for good. Shawnee Mission East remains in the No. 5 spot this week despite the loss. Gardner-Edgerton moves up one spot this week to No. 3 after a 49-27 win over Shawnee Mission Northwest on Thursday night. With the victory, the Blazers clinch the No. 1 seed on the eastern half of the Class 6A bracket. Topeka High’s Gregorio Leonardo connected on a 39-yard field goal as time expired to lift the Trojans to a 27-26 win at Emporia. The Trojans fall one spot in this week’s poll to No. 4, and close out the regular season against one-win Topeka West. For the first time this season, we have a new No. 1 team in Class 5A. St. Thomas Aquinas takes over the top spot after the Saints’ impressive 41-21 victory over Class 4A No. 1 Bishop Miege. Sophomore Tank Young rushed for 312 of the Saints 499 yards in the game and scored three touchdowns. The Saints edge out Wichita Northwest by a grand total of one point for the top spot this week. It’s nothing Wichita Northwest did wrong, in fact, the Grizzlies were dominant in a 65-26 win over Wichita Heights. Northwest, ranked No. 2 this week, will close out the regular season at Wichita Southeast. Maize stays in the No. 3 spot after the Eagles impressive 48-26 win over last week’s No. 5 Salina Central. Eagle quarterback Caleb Grill threw five touchdown passes in the game. The Maize defense limited the state’s leading rusher, Mustangs running back Taylon Peters, to 50 yards on 18 attempts. Defending Class 5A champion Bishop Carroll remains in the No. 4 spot this week after the Golden Eagles beat Wichita North, 39-19, and Mill Valley returns to the poll at No. 5 with an 18-7 victory over Blue Valley. The Jaguars beat Blue Valley for the first time in school history with a strong defensive effort that didn’t allow the Tigers to score until the closing seconds. Despite a second loss in three weeks, the voters left Bishop Miege in the top spot in Class 4A. The Stags have dominated this classification since moving back down to 4A in 2014. McPherson continues to dominate the AVCTL middle divisions as the Bullpups cruised to another 50-point win, 57-7 over Rose Hill. McPherson has allowed a total of 41 points this season, while scoring 352 points for an average of 50.3 points per game. Paola remains in the No. 3 this week after a 35-0 shutout of Eudora. The Panthers have now registered five shutouts through seven weeks of the season. Paola has a huge rivalry showdown with No. 5 Louisburg this week that will decide the Frontier League title and the No. 1 seed on the eastern half of Class 4A. Louisburg moved back into the poll, after a one-week absence, with a 25-0 win over Ottawa. Finally, Pittsburg climbs one spot to No. 4 this week after the Purple Dragons defeated Olathe East 28-21 in the first-ever meeting between the two schools. Goddard, ranked No. 4 last week, drops from this week’s poll after a 23-22, double-overtime loss to Maize South. Andale secured the District 6 championship with a dominating 55-6 win over Clearwater. The Indians allowed their first points since Week 1, ending a streak of five consecutive shutouts in the process. Andale closes out the regular season at Cheney (2-5). Second-ranked Sabetha won its 14th straight game with a convincing 56-0 decision over Wamego. It was Sabetha’s second shutout in as many weeks, and third of the season overall. 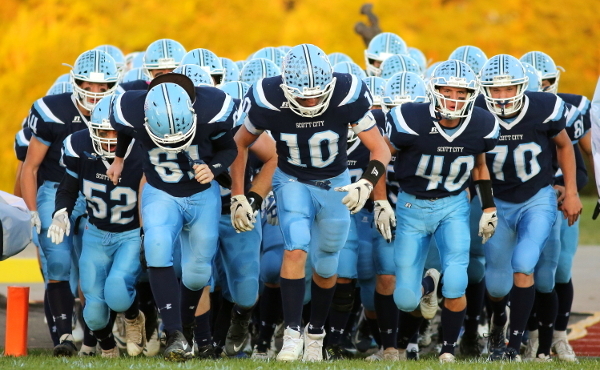 Scott City controlled the game and beat previously-undefeated Colby, 35-12. Senior Wyatt Hayes rushed for 155 yards and three touchdowns to lead the Beavers to the win. Fourth-ranked Pratt rolled to a 51-15 win over the 2017 Class 4A, Division II champion Holcomb Longhorns. Travis Theis passed for two scores and rushed for four more touchdowns in the game. Finally, Galena takes over the fifth spot in the poll this week thanks to a 38-0 shutout of Columbus. The Bulldogs are unbeaten on the season and average more than 46 points per game, while surrendering only six. Perry-Lecompton fell out of this week’s poll after a 20-0 loss to Topeka Hayden. Hayden lingers right out side the poll, just a couple of points shy of Galena in the No. 5 spot. Phillipsburg proved it remains worthy of the top spot in Class 2A with a 51-21 victory over Hoisington. The Panthers led 41-0 in the first half and cruised to victory. During the game, Panther kicker Jonathan Hunnacutt set the state record for career kick points with his 38-yard field goal in the second half. Hunnacutt now has 217 career points surpassing the old mark of 214 set by Olathe North’s Joe Garcia. Silver Lake outscored previously-unbeaten Osage City 48-26 on Friday to claim the District 2 title. Christian Stoner rushed for 223 yards and four touchdowns in the Eagle win. Third-ranked Conway Springs dominated No. 5 Chaparral, 53-23, to win the District 6 title. The Cardinals scored twice late in the second quarter to build a 33-17 halftime lead, then ran away from the Roadrunners in the second half for the 30-point win. Conway Springs takes on rival Garden Plain (5-2) this week. Chaparral drops one spot to No. 5 and will take on new No. 4 Hutchinson Trinity Catholic. The Celtics picked up a muddy road victory over Whitewater-Remington on Friday to improve to 6-1 on the season. Riley County drops out of the top five this week after losing 23-21 to Southeast of Saline in a game the Falcons led 21-0 at halftime. The top five in Class 1A remains unchanged for a third consecutive week. Top-ranked Smith Center cruised to another victory, winning 57-8 over Republic County. The Redmen hit the road this week to take on Ell-Saline (6-1) in a game that will decide the District 5 championship. Olpe stays at No. 2 after another dominating win – this time 54-0 over Marion. The Eagles have posted three shutouts on the season and have allowed single digits in three other games. Olpe travels to Hillsboro (6-1) this week to decide the District 2 title. Elkhart completed its regular season with a 51-8 thrashing of Stanton County. The Wildcats will now take a week off to prepare for the Class 1A playoff bracket to begin in two weeks. Centralia rolled to a fifth straight victory by beating Wabaunsee, 52-14. Centralia’s Kamble Haverkamp rushed for four touchdowns in the win. The Panthers will host Valley Heights (5-2) this week to decide the District 4 title. Finally, Jackson Heights remains in the No. 5 spot this week after 38-8 win over Jefferson Co. North. The Cobras will go for the District 3 title this week when they take on Lyndon. Central Plains rolled to a fifth consecutive shutout by blanking Moundridge, 52-0. The Oilers have allowed only 22 points all season and zero in district play. Hodgeman County ended a four-game losing streak to Spearville with a 54-8 win. Isaac Salmans rushed for 141 yards and four touchdowns and passed for 124 yards and two mores score in the Longhorn victory. Hodgeman County closes out the regular season with a trip to Ness City (5-2). Clifton-Clyde remains in the No. 3 spot this week after a 52-6 win over Washington County. The Eagles will be heavily favored in the final week as they travel to Lincoln (2-5). Fourth-ranked St. Francis hammered WaKeeney-Trego, 64-14. The Indians will take on rival Atwood-Rawlins County (1-6) this week in the battle for the Yoke. Finally, South Central stays in the top five this week after the T-Wolves cruise to a 52-0 shutout of winless Oxford. South Central has already secured the District 2 title, but will look to carry momentum into the playoffs with a win over Argonia-Attica (5-2) this week. The top five spots remain the same this week as Hanover retains the top spot after cruising to a 52-6 win over Wetmore. Meanwhile, Axtell, ranked No. 2 for a second consecutive week, outscored previously-undefeated Frankfort, 76-28. Hanover takes on Frankfort this week. Third-ranked Osborne made quick work of their district showdown with Northern Valley – throttling the Huskies, 68-0. Finally, No. 4 South Barber (6-0-1) and No. 5 Otis-Bison (5-1-1) both returned to the field after their tie in Week 6 to hammer a winless opponent. The Chieftains beat Burrton 70-8, while Otis-Bison defeated Chase, 70-6.